>but still dirty in some sense! Of course it is. But you can't reduce demand to zero. It would be a great idea for those that complain about the visual problem of windmills to take a drive from tyers through to Moe and check out what the view is along the way. It is quite literally a dirty great big barren hole. Trees and grass won't grow because theres no top soil and whats left is acidic. It wont fill to become a massive lake because unfortunately it doesn't seem to rain anymore. All you have is an ugly hole. If that doesn't bother them then show em some statistics of respiratory disease in the area, would you like some cancer with your Bronchitis perhaps Sir. I read a report many years ago where after repetitive testing of the ground around the Valley the pollutant levels were above the accepted levels and a solution had to be found. The best (most cost effective or perhaps only) solution was to make the smoke stacks higher so that the pollutants would be swept further away and hence wouldn't be so concentrated within the test area. Personally I believe that windmills say to tourists that the locals care about this beautifull environment enough to have them put up in there back yard instead of relying on the burning of coal and it's well known problems. I think they look ugly but i suppose it depends where you put them. A while ago a friend of mine was involved with a wind power green energy company and they said that one of the problems was that as soon as the possible sites were identified via some sort of wind map. Then along came speculators and drove up the price of the land with a susequent increase in cost. It seems like if there is a buck to be had then someone will try and capitalise on it. Can't really see that happening unless we have a good old-fashioned world war or a fair dinkum worldwide pandemic of some kind. How are you going to reduce demand for electricity in a world with a steadily growing population? There's a fair bit of hot air on this site. I wonder if we could somehow harness that. There's quite a lot of energy in methane. With the diet of pies and beers that most of us supreme athletes adhere to, we could at least run the server. Start collecting them and sending them in. Good call on "it gives the impression that the community is serious", and perhaps that will be a motivation in the future. Also, it gives a reference to compare the loss of visual appeal as well. So, if you're on the coast, the tourist $$s are probably not going to improve with some turbines there as well. But, out on, say, they Hay Plain, it might be worth the visual pain for the community. We'll certainly see. There is a lot more investor interest around at the moment, probably with the CPRS getting fired up. Looks like we'll do the 20% MRET pretty easily, which can only be good for the market. There's also a stack of Gvernment cash being thrown at wind forecasting, which will give some certainty to investors. Lastly, I note the EU has put up afairly hefty target for Copenhagen. With some luck, they'll blackmail Australia into aiming for the same sort of numbers, through trade restrictions or the like. There would be no point in having cheap goods here (with low carbon taxes) if they were taxed up the wahzoo on entering the EU. Coal fired power stations are designed to be big enough to cope with peak power loads. Costs of electricity are more strongly related to the capital and manpower required to build and run power stations, rather than the cost of the coal. Windmills (and solar power) are unable to provide reliable power at peak load times. They cannot reduce the required number of coal fired power stations. Wind power ( and solar power ) are much more costly than coal power, even ignoring peak load considerations. The claimed effects of CO2 from coal fired power stations on climate is a monumental political scam. There is not a single piece of evidence that man's CO2 has had any effect whatsoever on the global warming in the past 180 years since the Little Ice Age, or the current global cooling trend. >180 years since the Little Ice Age, or the current global cooling trend. Tony, everything you posted there is utter nonsense, and I am not going to make any attempts at reasoning with you on the topic. Anyone who thinks they know better than the UN, NASA and the Coal Industry clearly can not be reasoned with. I just had a friend round for coffee who is also a climate sceptic - this time telling me that there is some canadian study showing that all the data measuring temperature and sea level rising was bunkum and that there was a global cooling trend and no sea level difference at all. Sigh. >was a global cooling trend and no sea level difference at all. Sigh. If the coal industry admits they're causing global warming, I see no reason to argue with them. Has anybody got real statistics on the amount of dead bird carcasses located at the base of the big windmills that have actually died from being struck by the blades. I would hazard a guess that it is very minimal if anything at all. How many birds are stuck by climbers vehicles travelling to and from their favourite crags. Should we all just ride bikes there? Then what do we do if the little birdies start getting caught in the spokes!!!! >Should we all just ride bikes there? Then what do we do if the little birdies start getting caught in the spokes!!!! ...they usually come out as a puff of feathers. >to make any attempts at reasoning with you on the topic. Global oceans are cooling: "Cooling of the global ocean since 2003." >what do we do if the little birdies start getting caught in the spokes!!!! There's a decent report that's been done in the US. I can't remember any names on it though sorry, to help out with a search. The thrust of it was that in some areas (dependent on species in the area and the siting of wind farms) the impact was severe; like say on the Black Kite migration path and all along a ridge. Apparently bats also suffer severely as well. From this you can get some good information to make decisions on further planned farms, and reduce the mortality. Yeah I find reasoning debilitatingly difficult; that's why I did Engineering and Science at uni. As stated before I don't waste time with sceptics any more; frankly I don't care if people don't believe in Global Warming, Fairies or Evolution. The fact is that, somewhat fortunately, these sorts of people do not set policy nor govern international investment. > "Cooling of the global ocean since 2003." > Global atmospheric temperatures have been falling for 11 years. It's funny how the Bureau of Meteorology has given up on statistical forecasting because there is nothing in their records to let them base a forecast about the end of the current 13 year long drought. If you can deny climate change based on 'evidence' that goes back 8, 6 or 11 years then I say based on the last 13 years, the climate of Australia has irrevocably changed for the worst and there is no end to the drought in sight. 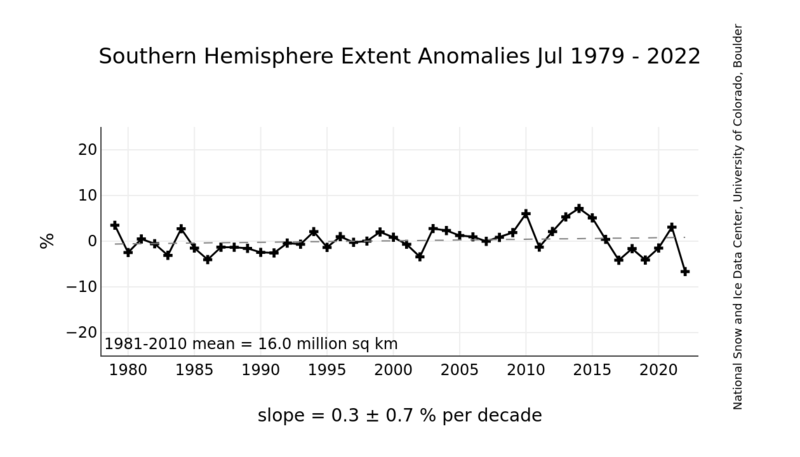 And is the Antarctic really 14-15% bigger than it was 30 years ago? The photos of the ice shelves breaking up (and recently published in the press) were probably photoshopped by the doomsayers to bolster their non-scientific theories, eh? I remember reading somewhere that it's permafrost areas that are shrinking while some areas that freezes and thaw are growing, leading to an overall increase in global sea level. I'll see if I can chase it down. but lets ignore the graph from the same website you have used to show that antarctic sea ice has been growing (http://nsidc.org/data/seaice_index/images/n_plot_hires.png) that shows a long term reduction in arctic sea ice Tony B? if you want some credibilty in your arguments you might want to be a bit less selective in the data you use to support them. so the page below talks about graphs with temperatures that dont continue to rise. a simple click on their homepage (http://hadobs.metoffice.com/) has a map showing surface temperature anomalies for the entire planet. plenty of areas have cooled but plenty of other have warmed. perhaps you shouldnt try to debunk global warming but try debunking climate change. and try starting in your own backyard. the BOM has loads of anomaly data for our mostly brown land and they also make plenty of predictions. funnily enough rainfall will increase in some parts of Australia but will decrease in others. Same for temperature. the clincher for me is farmers. probably the most conservative demographic after fred niles political party members. they're convinced something is going on and i reckon they are a pretty good litmus test. Coal power stations generally are poorly equiped to cater for greatly varying loads . When I was at uni we were quoted that brown coal would take 48 hrs to go from totally stopped to full power and their ability to quickly vary load is poor . And all those la trobe valley stations were either built or being built then . Those stations use coal to heat steam to run stem turbine generators and whilst they are extremely efficient users of the steam cycle the steam cycle can at maximum use around 30 % of the energy produced by burning the coal , the rest is put out into the atmosphere as heat or in hot watyer that disapated the heat back into the atmosphere through cooling towers and pondages. Gas turbines provide rapid response power and there is large capacity of this installed and up to 2000 Mw capacity being built or planned .Hydro also provides quick response but limited water are currently limiting its capacity. As far as I can work out the Victorian power companies pay little for the brown coal they use . Yallourn 1480 Mw was lost to victoria when the open cut flooded and most of victorias coal is reliant on three mines with little ability to supply other than their own power station. to burn coal at 30 % efficiency in La Trobe valley then send it at times over 600 km with transmission losses upto 20 % is not wise enegy policy. Wind and solar both may not produce constant power but current (Hydro) and other technologies can economically store power for use when required . Wouldn't it be good if there was an independent umpire on climate change - someone with scientific understanding who can review ALL the peer reviewed research and make sense of it all. Someone independent with no axe to grind. Anyone with evidence to say climate change is crap could submit it to the umpire for assessment. The umpire could then report on ALL the evidence from time to time. IPCC have just started on their fifth assesment report and I'm sure they would be interested in any evidence TonyB has on climate change. BTW, the IPCC seem to think climate change is a bit of a problem.